You don’t want to poison your body with toxic medication, but when your head is bursting from a migraine, you have to do SOMETHING! Plan ahead and next time you feel a headache coming on, you can try one of these pure, safe and natural home remedies for migraines. Aromatherapy is one of the most powerful home remedies for migraines. This type of cure will be different for each person. It depends on what smells trigger certain feelings. Put a few drops of these essential oils in warm or tepid water, then wet a soft cloth and apply to your forehead and neck. You can use a combination of candles, soaps, or massage oils in your most helpful aroma. Just make sure you are using the most pure, safe and natural essential oils and not the synthetic chemical fragrances sold in many health food stores. Beware of candles using chemical fragrances to mimic essential oils. 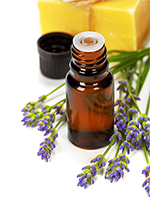 You can find pure essential oils both locally and online. Amazon has a large variety from many vendors, and we get some of ours from Starwest Botanicals. Considered by many to be the most safe and effective natural remedy for migraines, studies have shown that in pill form, Butterbur (or petasites) is very effective in treating migraine pain and asthma, as well as alleviate upset stomachs. A plant grown in Germany, standardized quality Butterbur can be ordered online, such as Vitanica Butterbur Extra, 120 Vegetarian Capsules . When your head is pounding and you feel ready to throw up, picking up the pace may be the last thing you want to do. However, exercise is a wonderful and natural way to get rid of a migraine. Physical activity releases natural endorphins, which are Mother Nature’s painkillers. People who suffer from migraines have found that it helps to do some form of mild exercise, enough to get the blood moving and oxygen flowing without creating physical stress. If you feel a migraine coming on, take a walk outdoors. Normally, a gentle to brisk walk of half an hour will be enough to stave off the migraine. Massage is another excellent natural cure to mitigate a migraine. Putting aromatic essential oil in the massage oil combines aromatherapy with the healing of physical touch. Have someone massage your back, shoulders, and the back of the neck. They should press on the base of the skull with their fingers and then slowly release the pressure. There are a lot of nerve ending in the scalp, and muscles that traverse from the base of the neck to the forehead, so gently massaging the scalp can release some of that tension you are holding. To massage yourself, rotate your fingers over your head, or give yourself a foot massage if you can do so without straining. Putting pressure on the webbed part of your hand by squeezing your opposing thumb and forefinger over the pressure point is an effective acupressure technique for curing migraines. You can put a cold pack on the back of your neck to ease pain. Be sure the cold pack has several layers to prevent damage to the skin. If your neck and shoulder muscles are very tight, a hot, wet towel might be more effective to loosen the muscles. One home migraine cure is to place your hands in hot water. (Let me at those dirty dishes!) The theory is the hot water will draw the pressure away from your head. If you suffer from hormonal migraines before or during your menstrual period, low progesterone may be your migraine trigger. Balancing hormones should be undertaken with your Naturopathic Doctor or holistic physician, but you can obtain an over-the-counter version if you want to test the theory before talking to your doctor. Natural bio-identical progesterone should contain 2-3% USP progesterone, which is 450-500mg per ounce of cream. Pro-gest by Emerita is considered by many to be a superior brand. In any case, find pharmaceutical grade, indicated by “USP,” without a bunch of additives and fragrances, and follow the directions carefully, as progesterone should be applied only for two weeks before your period. For a complete understanding of how progesterone works in the body, be sure to read the book by Dr. John R. Lee What Your Doctor May Not Tell You About Menopause (TM): The Breakthrough Book on Natural Hormone Balance . Dr. Lee’s information is a real eye opener on a subject to which most of us don’t pay much attention until symptoms arise. Every woman and man should read this book before the age of 40. Meditation, prayer, and yoga asanas (postures) are effective methods to treat migraine headaches. Avoid bright lights and loud noises. Find a quiet place to rest, close your eyes and relax. If you find you can’t sleep during a migraine, at least rest. Try taking a hot shower or “letting go” in a warm bath. This will help relax the body and ease the stress that causes migraines.